In the Old West, the sleepy town of Rose Creek is plagued by savage outlaws led by Bartholomew Bogue (Peter Sarsgaard). They burn down a church and slaughter many of the innocent civilians in order to drive them away from their parcels of land. The widow (Haley Bennett) of one of the men they killed approaches Sam Chisolm (Denzel Washington) to ask for help. 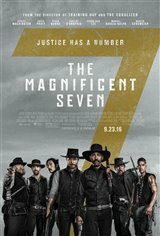 When he hears Bogue's name, Chisholm agrees and rounds up a group of six diverse men, including wise-cracking gambler Josh Faraday (Chris Pratt), to take on the outlaws.